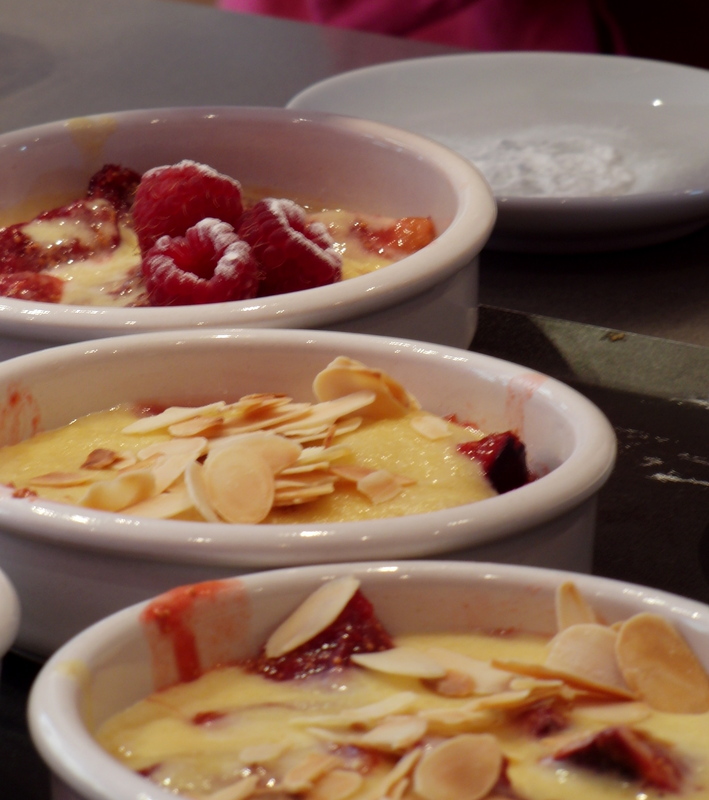 Just a regular Wednesday afternoon dessert at Les Secrets Gourmands de Noémie, an incredible French cooking school in Paris’ 17th arrondissement. This is one of the most extraordinary desserts I have ever had, I with my larger than life sweet tooth. The amaretto liqueur is an absolute necessary ingredient, and do not be shy with it. It may seem like a lot, but in truth the final product offers just a hint of its sweet, almond flavor. 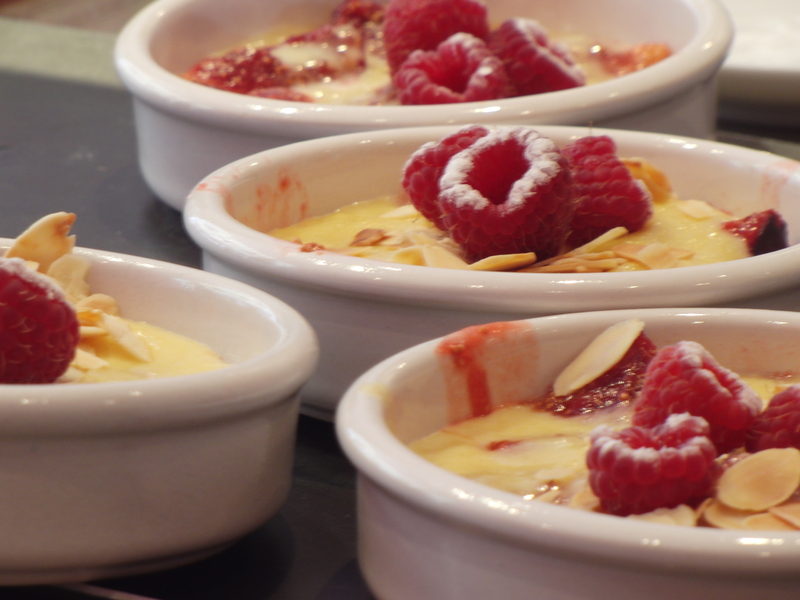 Noémie explained that it is necessary to have something to add fragrance to the dessert, whether that be a sweet wine like a sauterne or a dessert liqueur; whatever is available in your cupboard. 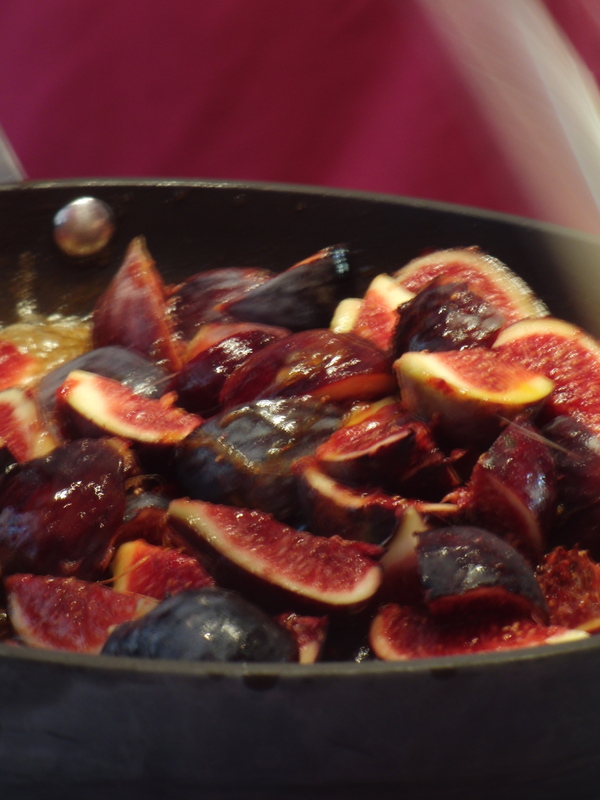 If figs are not available, try plums, apricots, peaches, pears, cherries, or an assortment of fruits such as blackberries and blueberries. 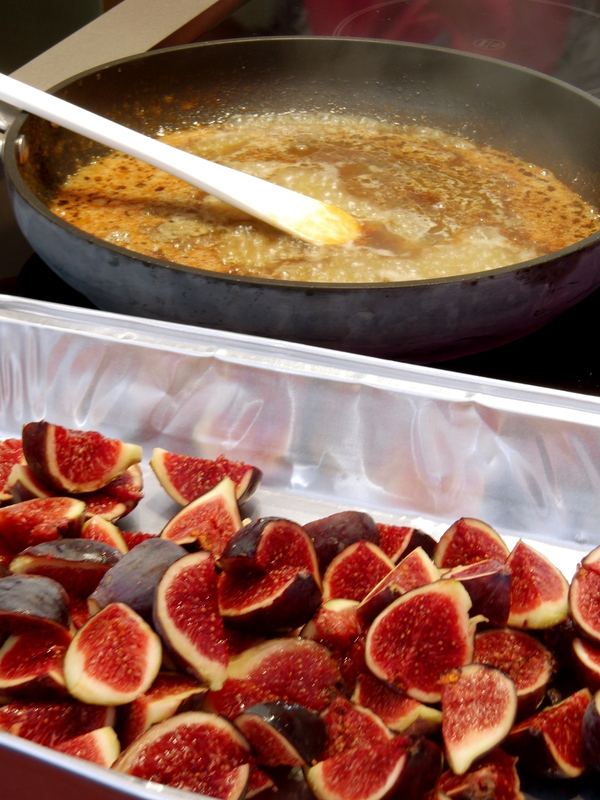 Wash the figs and dry with a paper towel. Cut each into 4 quarters. 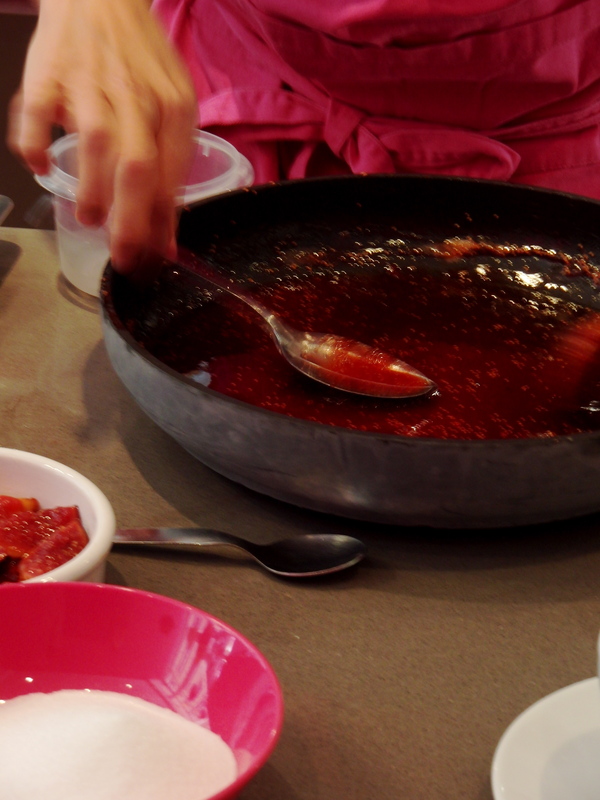 Prepare the caramel sauce in a large pan. Cook 150g of granulated sugar over medium heat without touching the pan. The sugar will melt and quickly turn into a blond caramel. 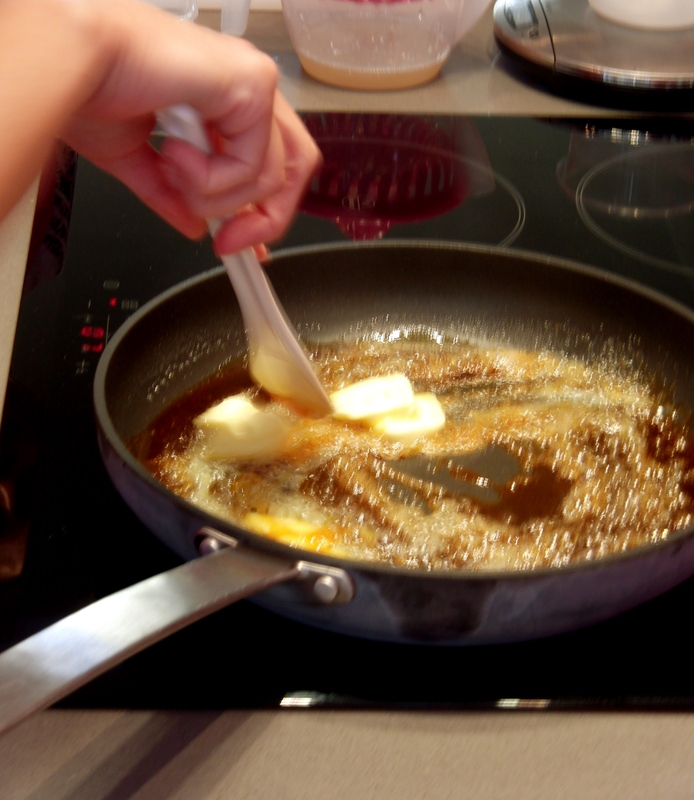 Remove the pan from the stove and add the butter and lemon juice. See the above photo for a visual. 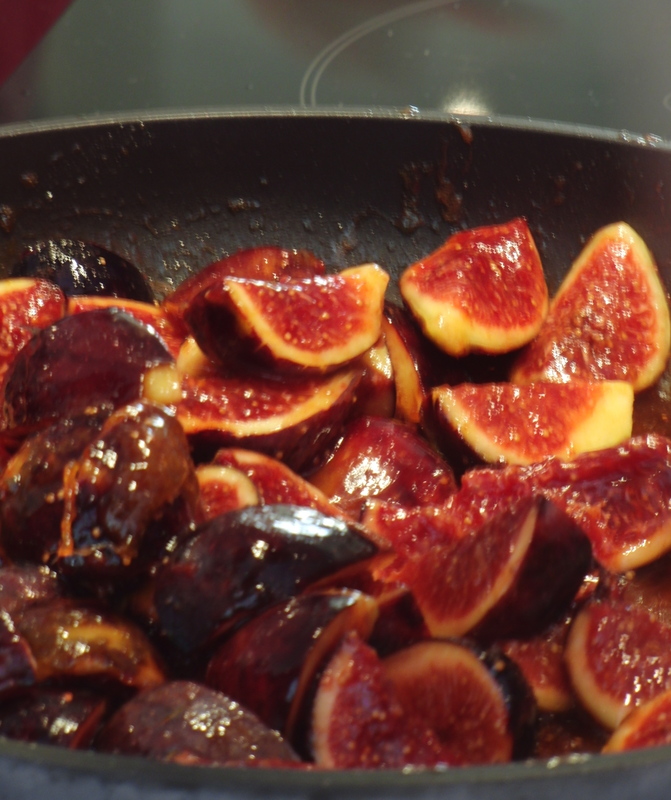 When the butter is melted and combined with the caramel, add the figs. 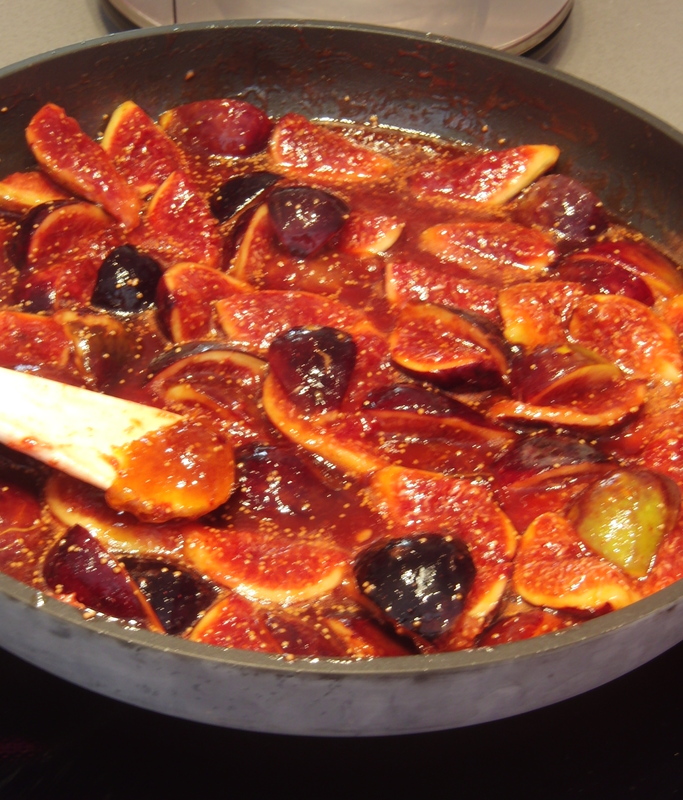 Cook for one minute, rubbing the fruits into the caramel. Reserve the fruits on a plate. 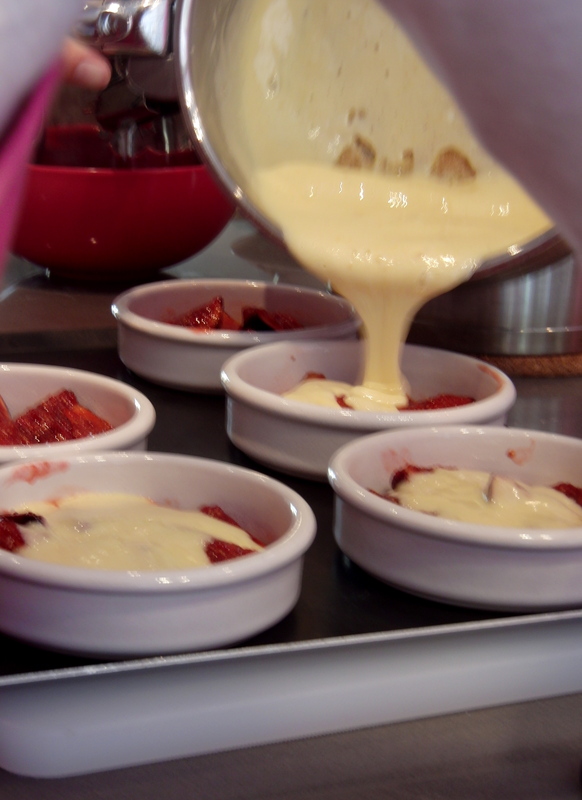 Now prepare the sabayon: Combine 6 egg yolks with 250g of granulated sugar in a bowl. Whisk to whiten. In a saucepan bring water to a boil. Remove it from the stove. 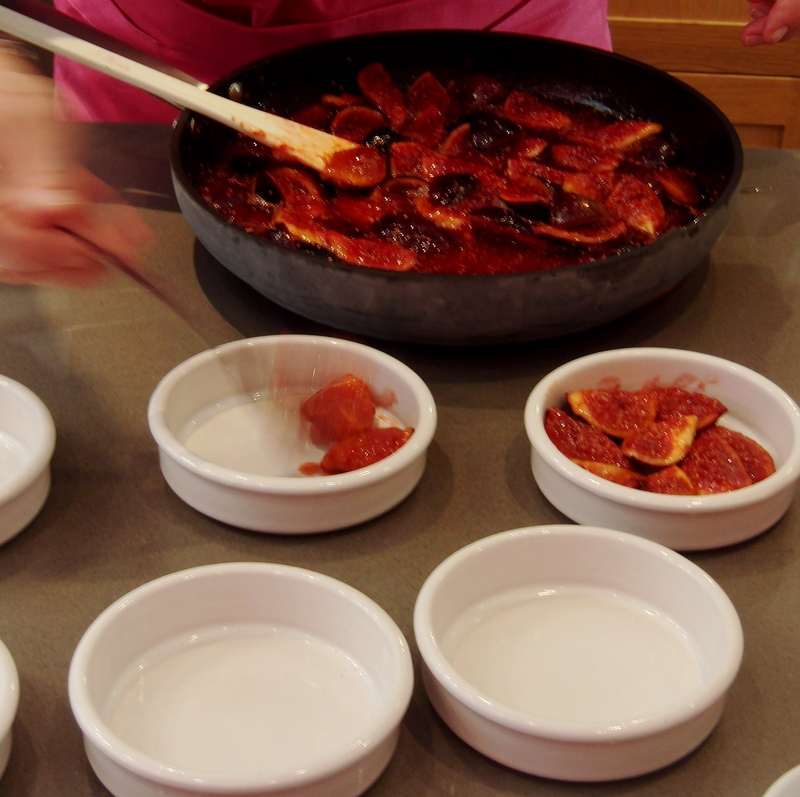 Place the bowl over a saucepan and whisk vigorously while adding the amaretto (or wine) little by little. Whisk until the mixture doubles in volume and gets foamy. 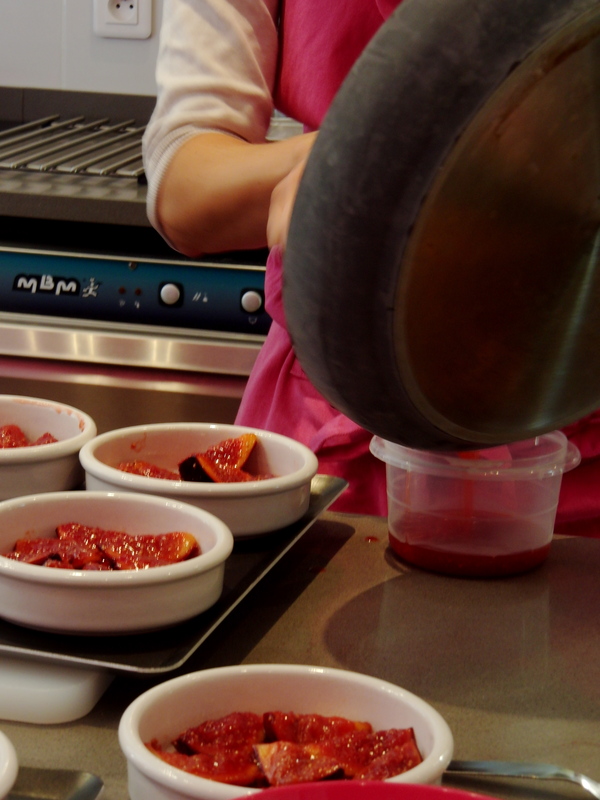 Place the figs in the bottom of the crème brûlée molds. 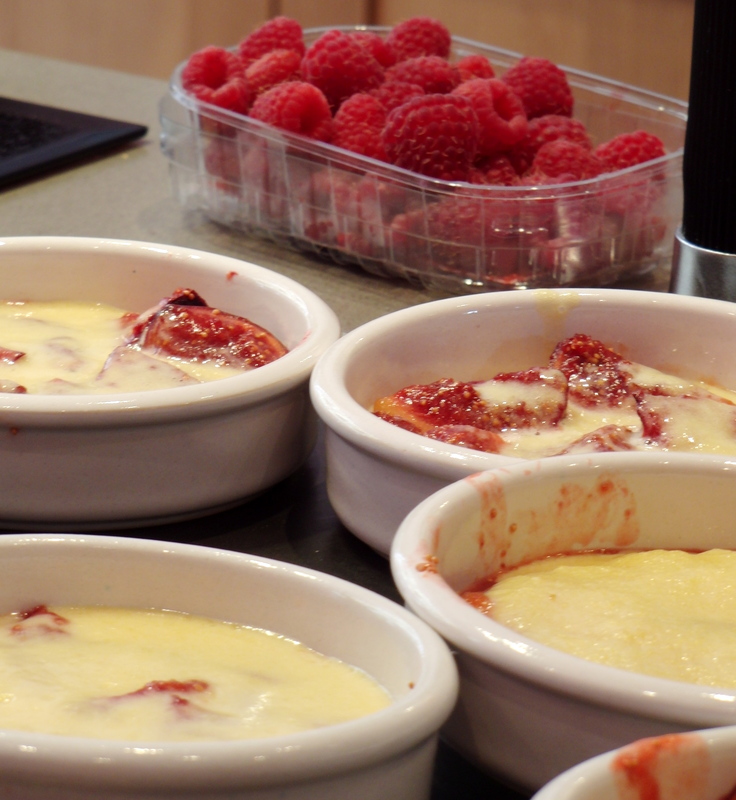 Cover the fruits with the custard. Torch it or place it under the broiler to get a nice brown color on top. Toast the sliced almonds and sprinkle on top. 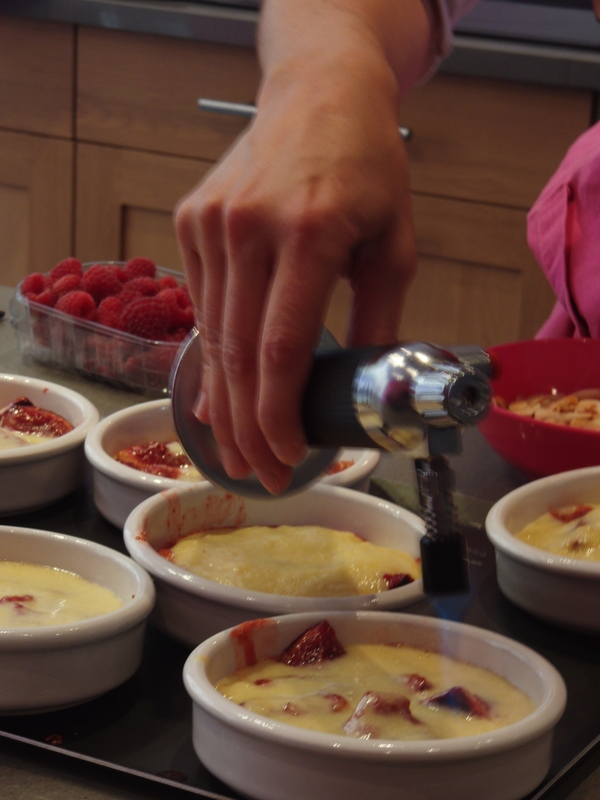 For a dash more color, dip the tops of raspberries in sugar and place 3 raspberries on top of each mold (always garnish with an odd number- specific instructions from Chef Noémie- everything looks better in odd numbers).